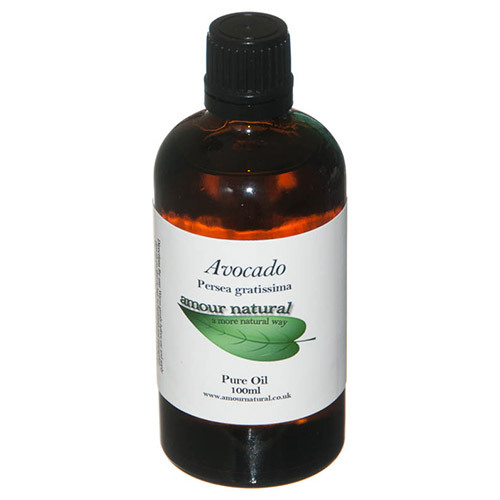 Avocado oil is a luxurious, rich and nourishing oil, popular for strengthening and replenishing skin and hair. It is rich in saturated and monounsaturated fatty acids, natural lecithin, proteins and vitamins A, B, E and D.
Its high skin penetration and rapid absorption rate make it ideal for dry, mature skin, brittle hair and nails, stretch marks, age spots, fine lines and wrinkles. Avocado oil is produced by mechanical cold pressed extraction and centrifugal decantation. It can be applied on its own, but it is more commonly mixed with other carriers such as sweet almond, jojoba or wheatgerm. Try a ratio of 10-30% avocado oil. Adding Amour Natural’s pure essential oils will further enhance the therapeutic properties of the oil blend. Warm gently before use and apply directly on skin or hair to replenish and strengthen. Mix with other oils for a massage blend. Can be used as an ingredient to make your own hair, body and face products. Below are reviews of Amour Natural Avocado Pure Oil - 100ml by bodykind customers. If you have tried this product we'd love to hear what you think so please leave a review.